Then I went off on a tangent and got some card kits from Modelik. 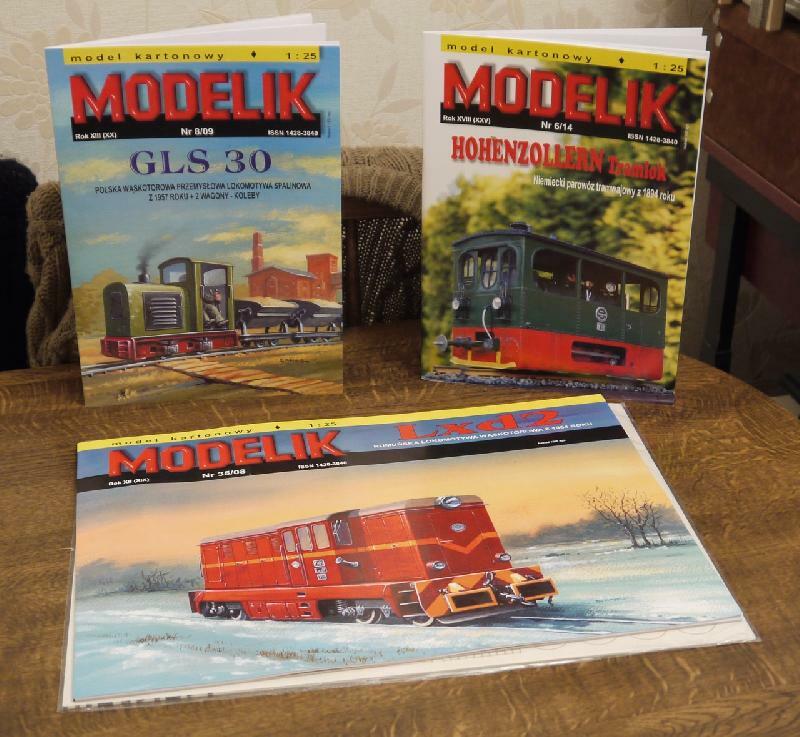 It was all going so nicely - I have built a workbench for the loco shed, painted some wagons and even completed some figures but there was a little voice coming from the Modelik GLS30 kit, just whispering at first, "Build me. Build me"
Unfortunately the little voice got louder and my resolve crumbled, so I got the styrene sheet out. Before starting the model I enlarged the pages of the kit by 104% on my printer to convert them from 1:25 to 1:24 scale for consistency with my other locos. 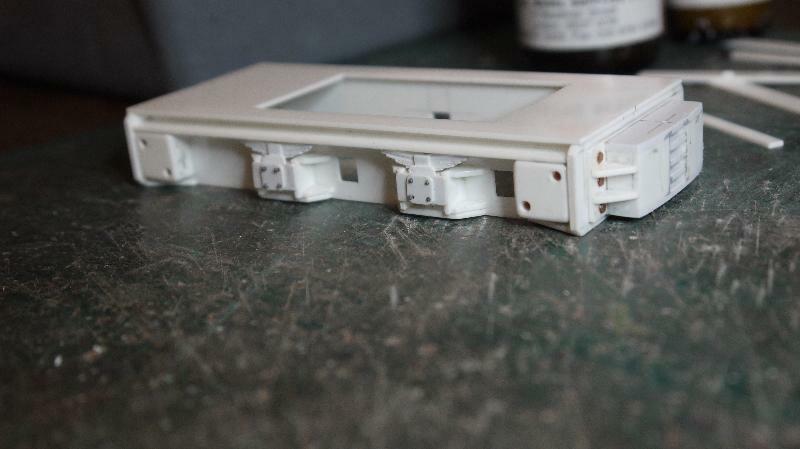 Most of the underframe on the prototype looks like it was welded so it was relatively easy to put the basics together from 40 thou sheet. 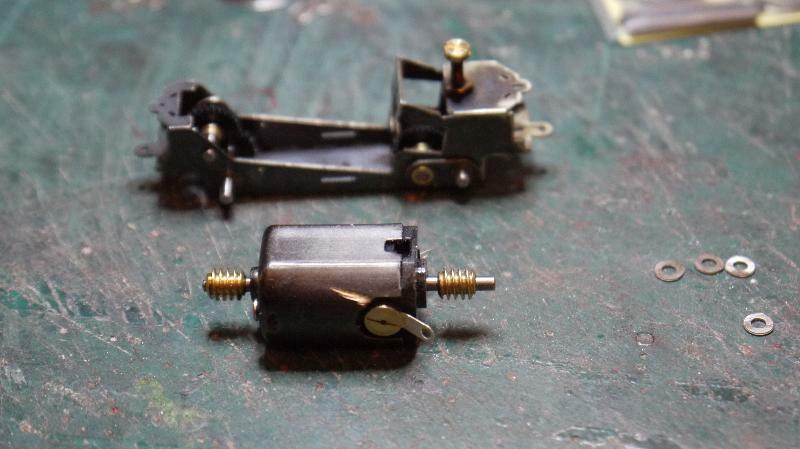 I have just got a North West Short Line Chopper 2, so this made quick work of cutting a lot of identical parts for the axle boxes and springs. This is the result of a couple of days hacking and sticking. The front of the loco is to the left in the photo above. It is about the same size as my Bagnalls, as you can see when it is posed next to Sipat. 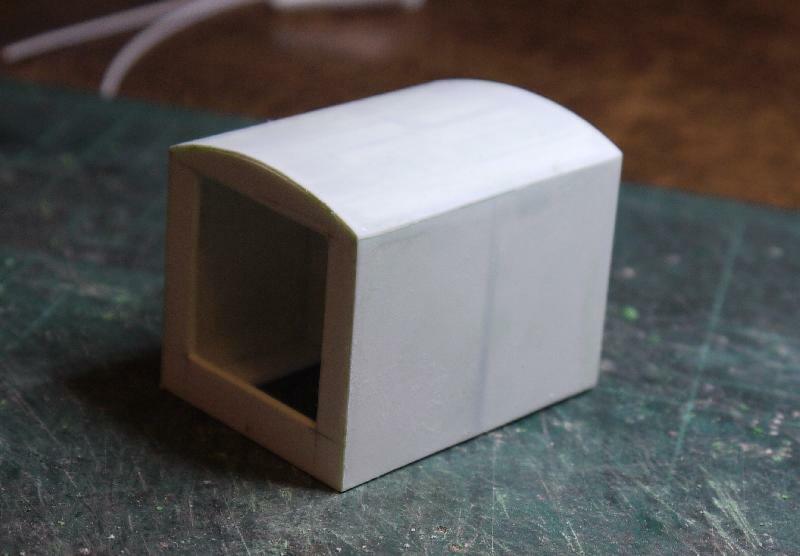 The next things to be made will be the buffer/coupling blocks and some weights that are bolted to the frames just inboard of the buffer beams. It is going to be a chunky brute when it is finished, something like 50% longer than my Dragonfly. The main problem now is how to explain away the presence of a Polish diesel loco built in 1957 at Smallbeach which is supposed to be in Shropshire. Got out of control and crashed through the Iron Curtain perhaps? I couldn't see the pictures... and then tried the main site link and it is working for me now. This looks really good, I'll be following. I suspect that the loco was imported through a contact made years ago. Got it for scrap price and couldn't pass it up. I'm going to have to try one of those kits one day. Impressed with this one too, and will also be following. I'd not heard of these kits up to now. I really like your Bagnall, too. 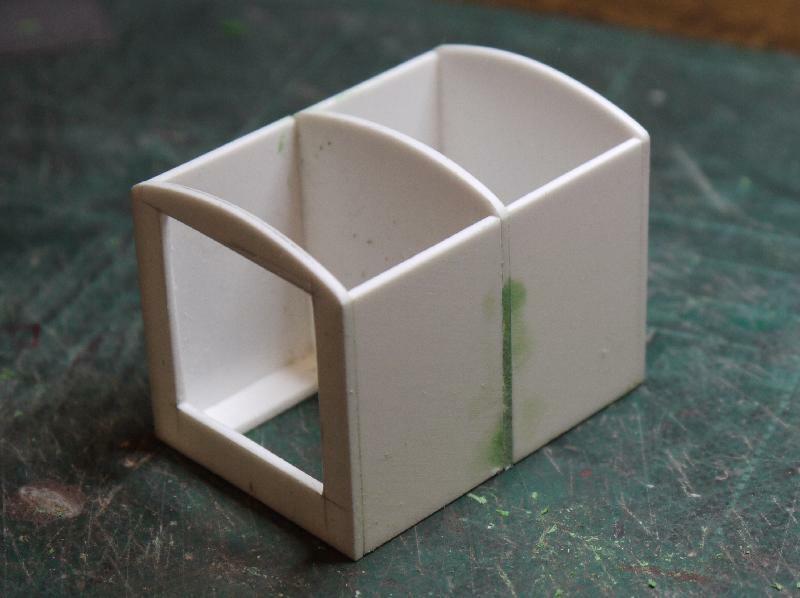 My original intention was to build the card model from the Modelik kit in parallel with an operational model in styrene. The card version seems to be slipping down the 'to do' list a bit as other things are starting to make demands on my time again. The other reason for not starting the card kit is that I have not got any glue that will stick card together - well that's my feeble excuse and I am sticking to it! 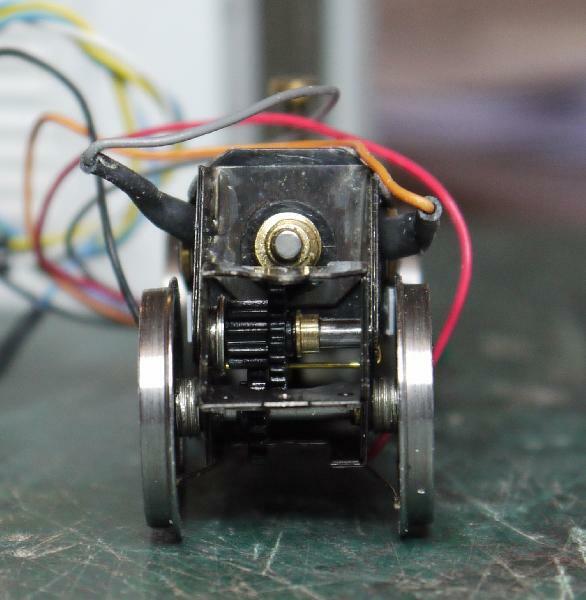 I have been working out how to motorise the model, and I think that this will be based upon the Slaters FD03 final drive gearbox https://slatersplastikard.com/assets/pdfs/MotorGearboxFlyerFeb13.pdf and some sort of gear head motor driving down to a layshaft connecting the FD03 units. Wheels will probably be from Markits, the BRM4-9 wheels are the right diameter and the spokes can either be filled in or covered with a disc of styrene. Their catalogue is here http://www.markits.com/MARKITS_Price_Guide_2013_09.pdf. Some form of suspension may also get fitted to the chassis as well. I can see this loco causing a row amongst the Smallbeach diesel drivers because it has a cab roof that the other diesel locos do not, so there will be a dash to 'bag' the GLS30 in wet and cold weather. There has been a bit of progress on the GLS30 over the weekend. It now has ballast weights and coupler blocks fitted. 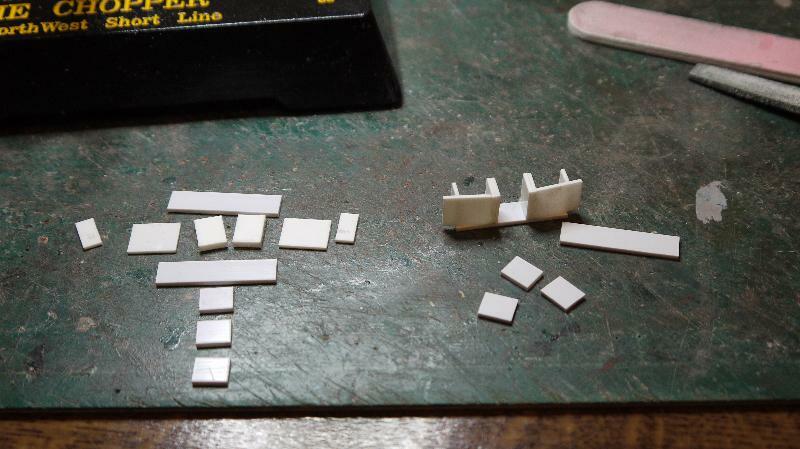 The coupler blocks were cut from 40 thou and 60 thou styrene sheet. A part assembled outer part of a coupler block is on the right and the component parts are on the left in the photo below. 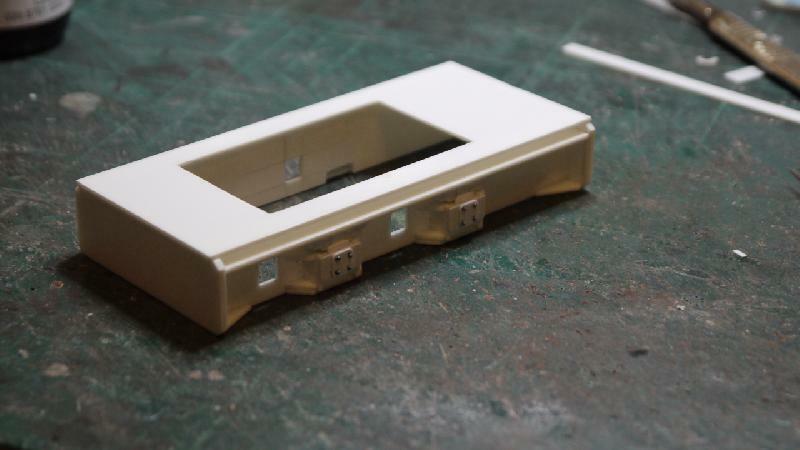 I tried adding the three pieces in between the centre uprights to make up the dividers for the coupler slots and found that they were a little over length, making the bottom plate go banana shaped. Change of plan - rip out the dividers and add the top plate, let the solvent set and then add the divider pieces. Straight couplers at last which now looked like this. 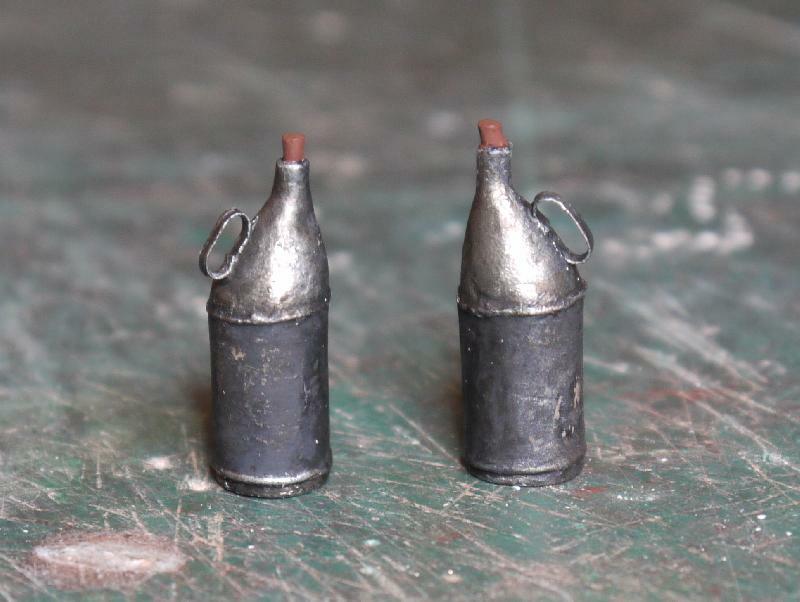 The hollow spaces were filled with 'liquid lead', basically very fine lead shot. This was secured with superglue as the PVA suggested on the instructions reacts with the lead shot to produce an oxide which swells up and pops the model apart after a while. Backplates, cosmetic bolts and gusset pieces were added next and any visible seams were filled with Gunze Sangyo Mr Surfacer then sanded smooth. Top and bottom seams between the outer parts and back plates have been filled and need to be sanded down in the photo above. The aim was to get coupler blocks with no visible seams as the originals look like they are cast steel. I have not got a clue what is in Mr Surfacer as most of the writing on the jar is Japanese - I am only fluent in gobbledegook and gibberish! The stuff does pong though, but sets quickly and sands down to a good finish. The photo above also shows one of the ballast weights tucked in behind the buffer beam just ahead of the axle box. 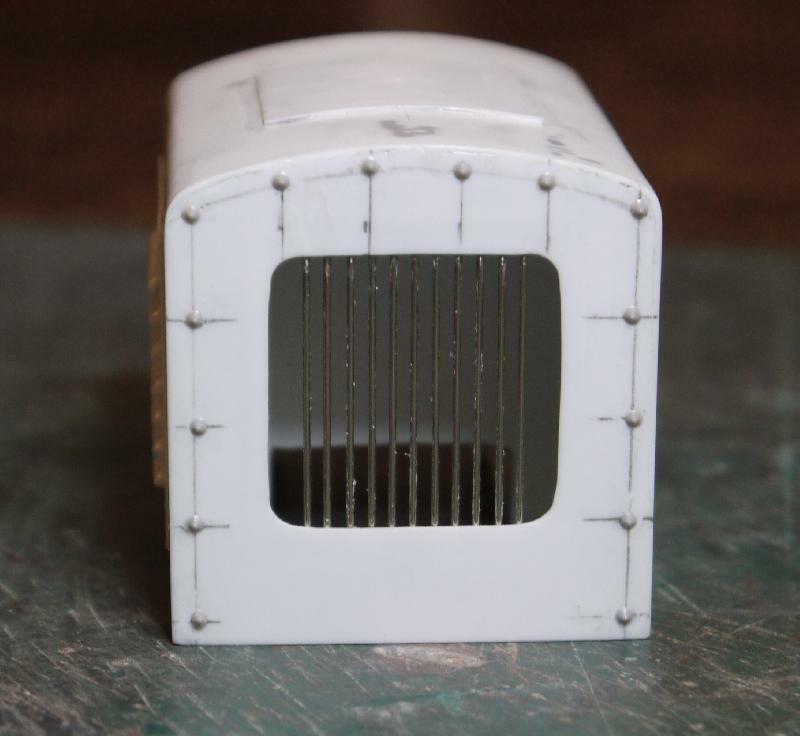 Once the holes were drilled for the coupler pins the completed coupler blocks were fixed to the buffer beams. This thing is getting bigger. 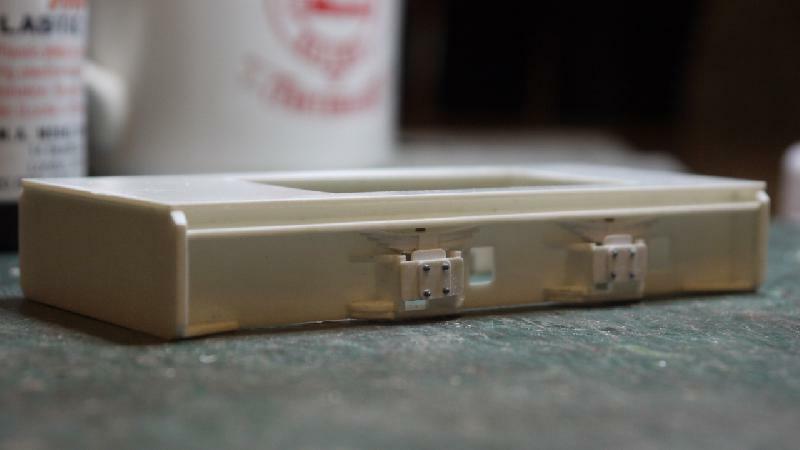 The length now that the coupler blocks have been added is 122mm and overall width is 48mm. I have been trawling round on the internet for possible drive solutions and the 8ft 6in LoRider from High Level Kits http://www.highlevelkits.co.uk looks promising (click on the 'Bogie' heading), so long as it can be fitted with large enough wheels. High Level Kits also do a very useful range of gearboxes and motors which may be able to be adapted for the GLS30. Further investigations on the drive problem to follow I think! A bit more progress has been made on the GLS30. After a lot of dithering I finally went for the High Level Kits LoRider to power the loco. This has a 48:1 gear ratio, so should be very controllable at low speeds. 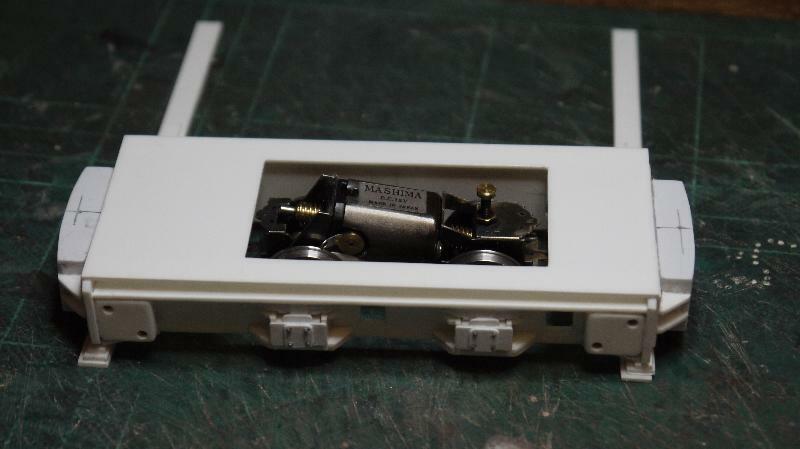 The LoRider comes as a nickel silver etch with all the gears and other bits needed to mount it in a 4mm scale diesel. 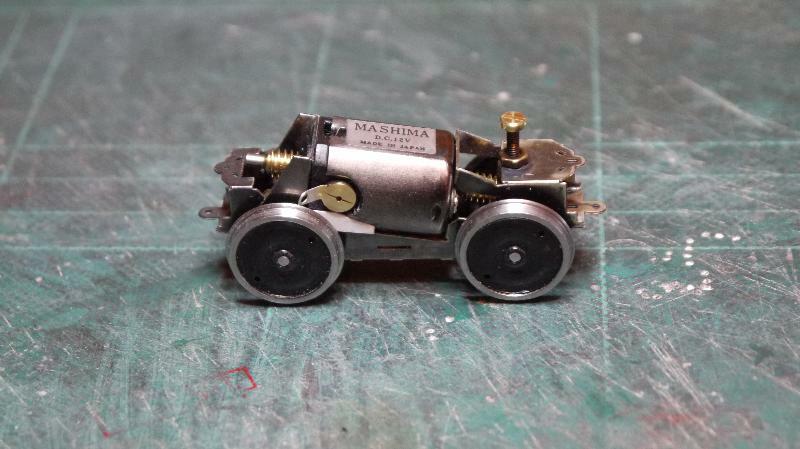 You need to get a Mashima 1420 motor (also available from High Level Kits) and your choice of wheels, although these must use a 2mm axle. I used wheels from Alan Gibson Workshop. 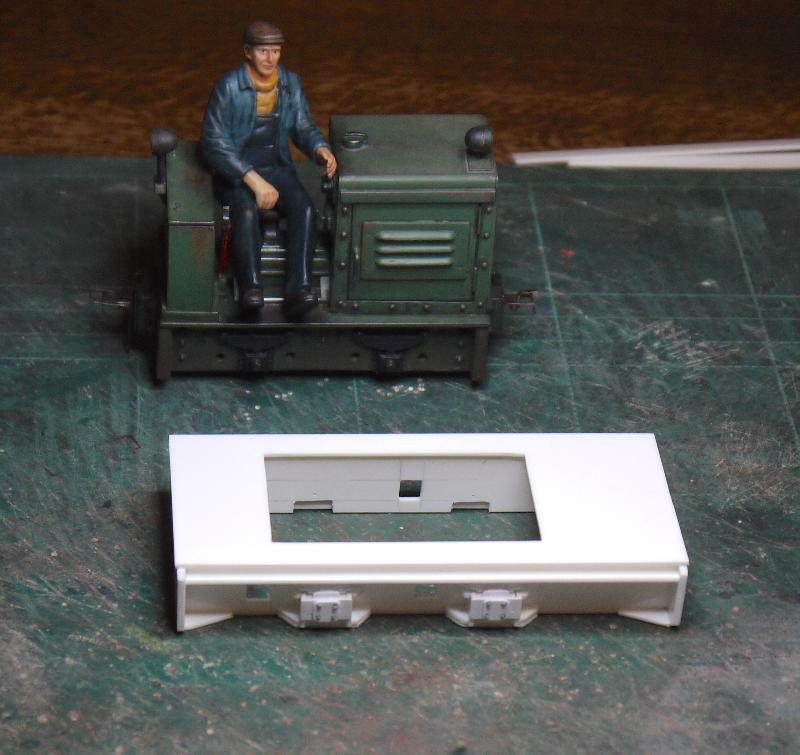 Although the scale size for the GLS30 wheels is 19mm, the largest that can be fitted to the LoRider is 16mm, but this is not a problem as the wheels are largely hidden by the loco's side frames. 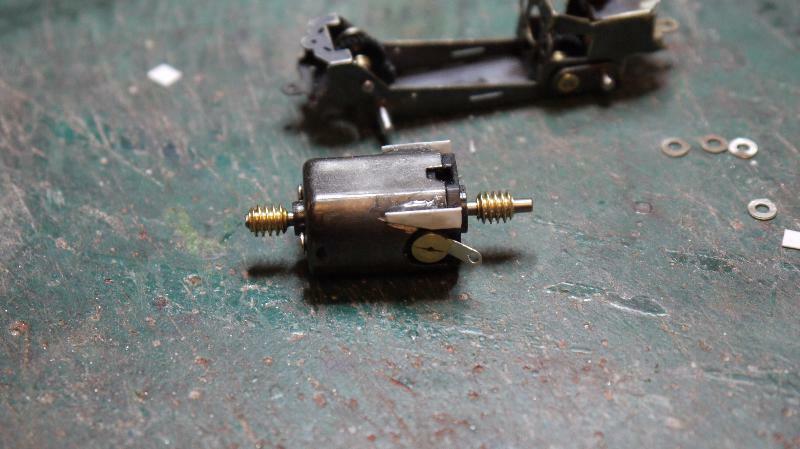 It does need a little filing off the sides of the motor to ensure that the wheels cannot touch it and short out. I had to be careful not to damage the brush holders and their connection tags, it would be a bit embarrassing having to send off for a new motor. You can see where I have added a couple of pieces of 10 thou styrene to make sure that the wheels cannot touch the motor. The complete unit is below, just waiting for pick-ups and a DCC chip to be added. 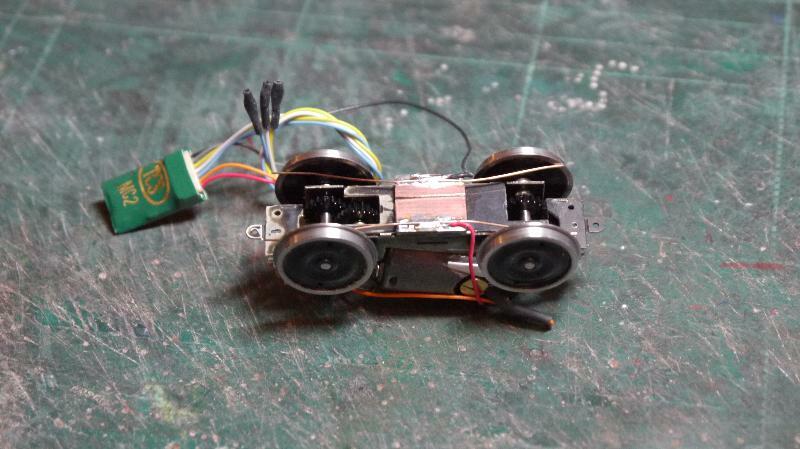 It will need some heat shrink adding to the motor connections when I get round to wiring the unit to make sure that the tags cannot touch the wheels and blow the DCC chip. The screw sticking up at the right hand end is to set the ride height as I have built the unit with a compensated axle. There is the option of building the LoRider as a rigid unit, but for rail pick up the little bit of extra work to add compensation is well worth it. 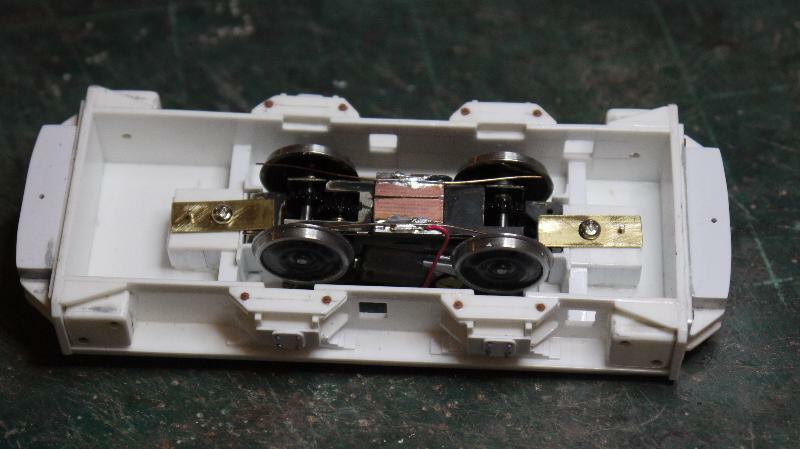 I also chemically blackened the chassis unit after the soldering was complete, but before all the gears were added. 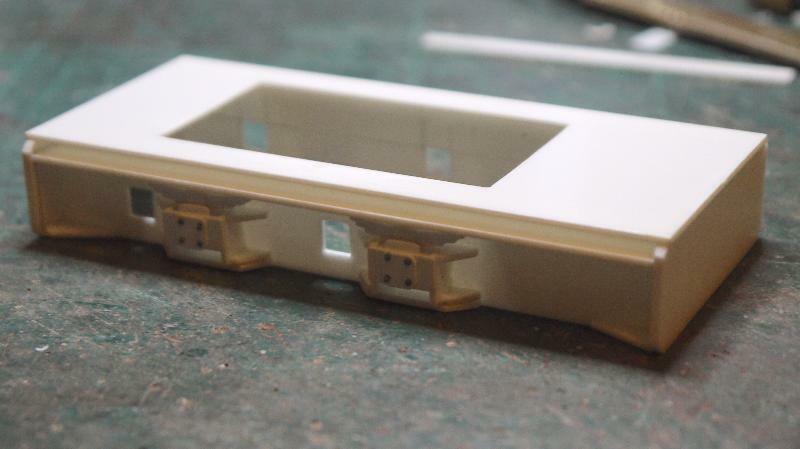 I packed the loco frames up to their ride height on some scrap styrene and placed the LoRider in the middle to see how much of the assembled unit is above the footplate level. As you can see there is not much in the way of adding full engine and gearbox detail, so I may have to leave the bonnet sides off. The next job is to figure out a fixing for the LoRider. Excellent service from both High Level Kits and Alan Gibson Workshop, so I will have no hesitation in using them for supplying the drive and wheels for future models. I am not connected with either of them except as a satisfied customer before you ask. That Chassis is looking great, and the gearbox system is wonderful. I wish we had a company like HighLevel here in the US. I'm really enjoying this one, Steve, thanks for going into so much detail. The "cast" look to the couplers is spot on. I didn't know that lead shot & PVA combined did that - one for the back of my mind. I just got the GLS 30 kit. I hope you continue with these builds. I'll watch! There has been a little progress on getting the LoRider power unit finished. 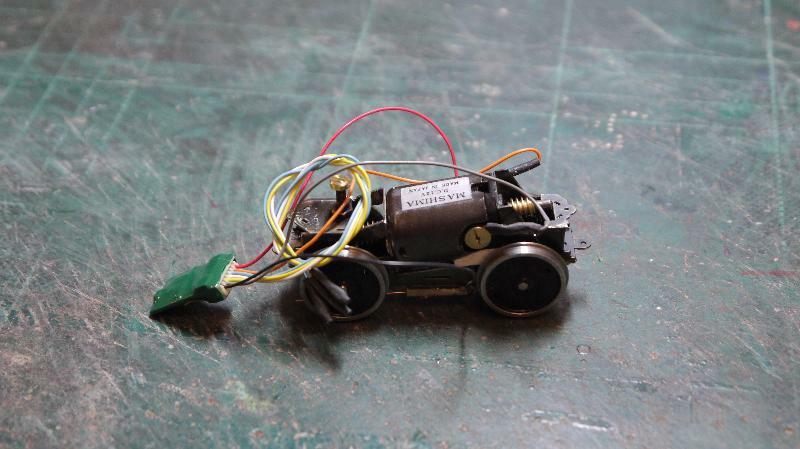 It has had pick ups added using a piece of circuit board and 0.3mm phosphor bronze wire. 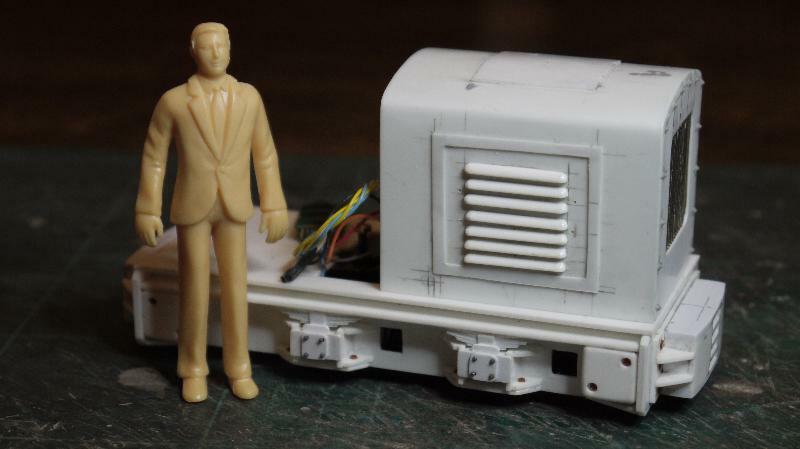 I have used a TCS MC2 decoder as this is a little smaller than the T1 so it will give me more options for hiding it on the finished loco. The wiring has been left quite long, again to give me scope for hiding the decoder. I have also got the LoRider centred in the GLS30 frames and located it with a couple of the 14BA screws that come with the kit. Next job is to make up a couple of clips to stop the LoRider falling out when I pick the loco up. In a first for me I managed to wire up the motor so that the loco runs forward when forward is selected on the controller. Trouble is I am thinking of turning the LoRider round so that the wiring tags will be definitely inside the bonnet rather than possibly protruding in to the cab. Then forward will be reverse. At least I am used to adjusting CV29! I keep going back to this for a bit of inspiration https://www.youtube.com/watch?v=aewbTPdWG9E and wonder how they manage to keep anything in some of the skip wagons given the amount of holes in them. No race that I know of... I'm sidetracked again. I'm building a Piper J3 Cub model for mail delivery to my little town. I think the GLS is safe for now. I can't see your pics, I'm on the backup site and it isn't cooperating with me. I decided to turn the LoRider round to be certain of hiding the wiring inside the bonnet. For some strange reason the loco sat with the front end about 1/2mm lower than the back, but since turning the LoRider round it sits level. 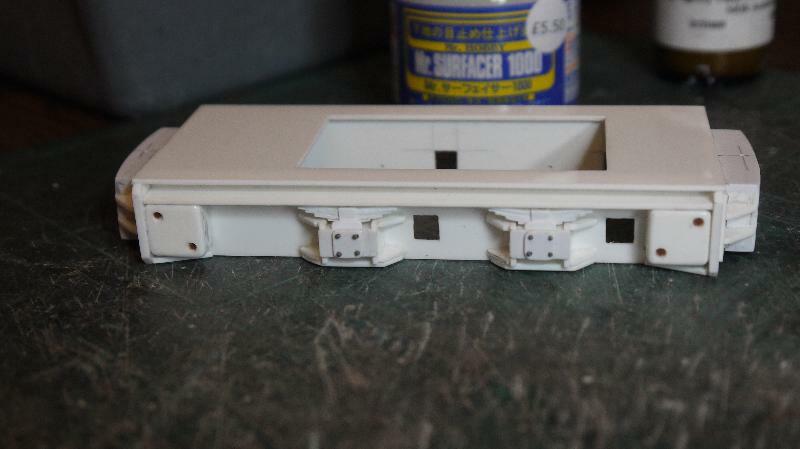 I have added some pieces of 1/8 inch plastic angle to the underpinnings to keep the loco sitting upright and added a couple of clamps to hold the LoRider in place. 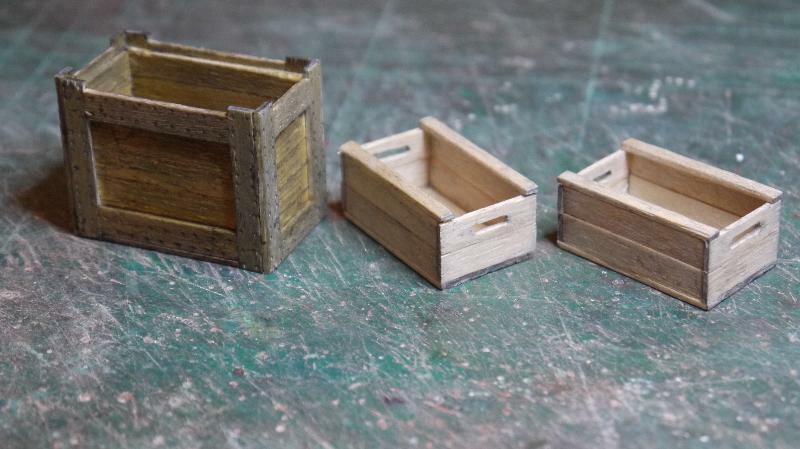 Then I got a bit distracted and had a play with some strip wood as a change from styrene bashing. Then the Bagnalls needed some oil cans. I wonder why I can't see any of your images? There is something strange going on as I could not see the pictures on this thread either - and I put them there!! All the photos were uploaded through http://my.gn15.info without any problems. I went off and looked at something else, then returned here and the pictures were visible. All very odd. I can't see any of them. I hate to ask, but could you post them somewhere else too? Here is the message I get when I try to open one of the images. Obviously I have an internet connection, I'm looking at and replying to the thread... on the Gn15 address. I finished the fight with the bathroom tiles, so its back to the GLS30. 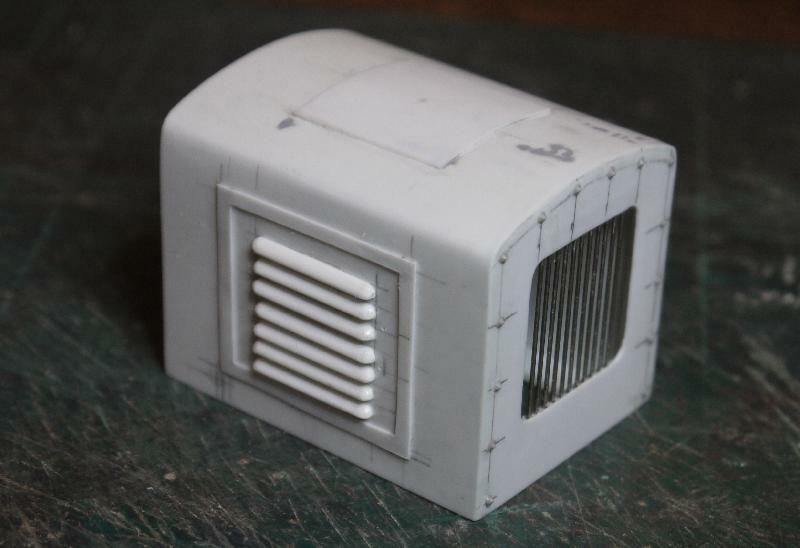 The bonnet was based on three profiles cut from 60 thou styrene, less an allowance for the thickness of the cosmetic overlays. It's obvious now, but I should have made the sides in one piece and narrowed the centre profile to fit between them. It took ages and naughty words to get the sides straight. 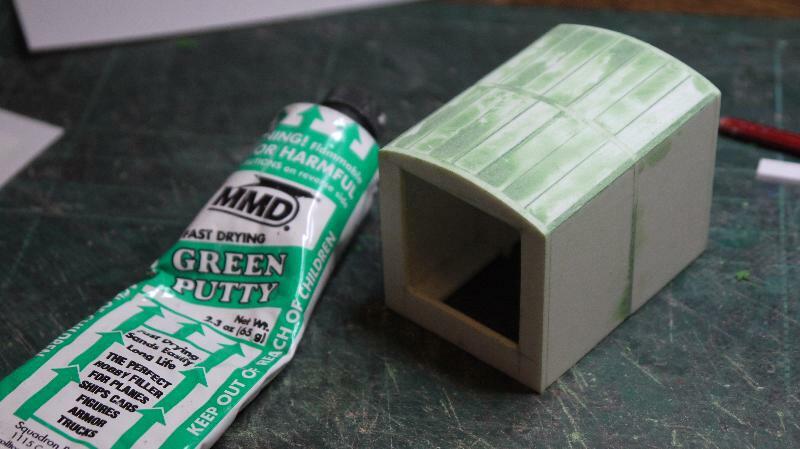 The top was closed with some strip styrene and filled with a bit of green putty, then sanded smooth. It is best to check with a straight edge to make sure that you do not sand any dips in to the top of the bonnet (been there, done that, don't want to do it again!). 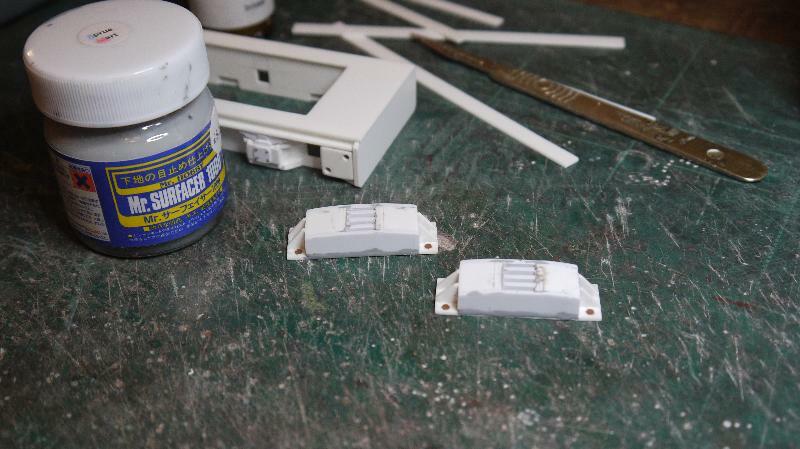 Then I started adding the cosmetic skin using 15 thou styrene. The first layer was added and the corner radius sanded once the solvent had set. Two further layers of 15 thou were added and each was bent around the bonnet in one piece. The front was another piece of 15 thou, stuck on to a photocopy of the card kit part so that I could cut the opening without having to measure it. Louvres were made from some Evergreen 1/16 inch quarter round section. 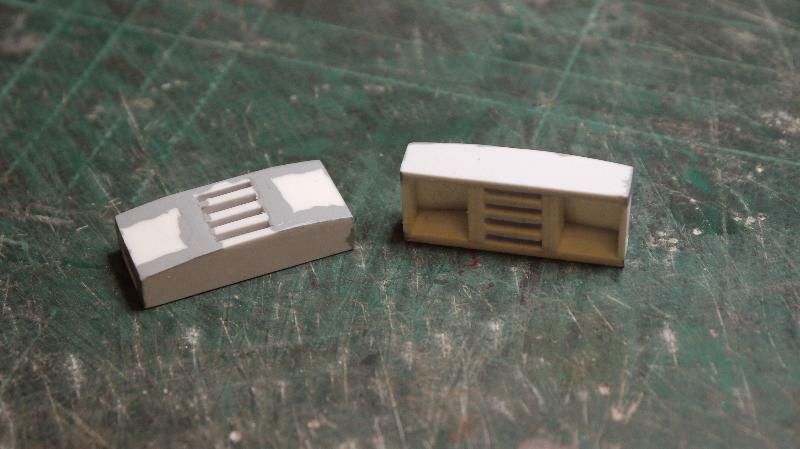 Another photocopy of a card kit part was stuck to some styrene to set the spacing between the radiator grille bars, and the completed grille was trimmed to size to fit behind the bonnet front. 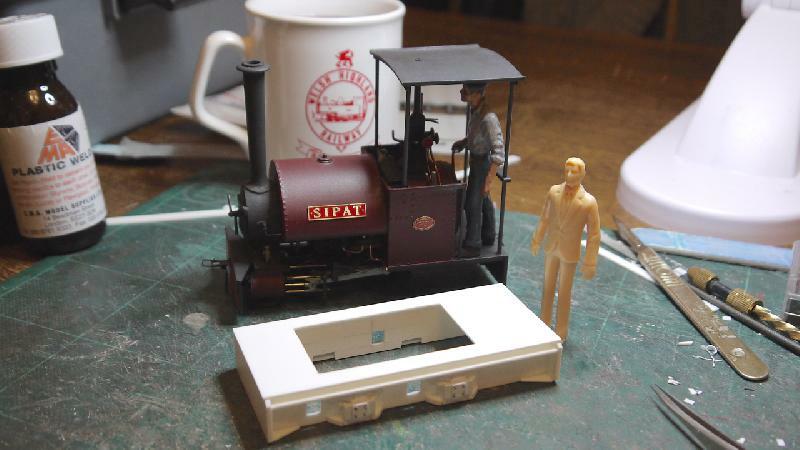 Finally a shot of the bonnet perched on the underframe with a figure for a size comparison. This is going to be one chunky loco. There are a few things needed to complete the bonnet. I still have have to make a radiator to fill the huge hole behind the grille, and the air cleaner perched on top of the bonnet. 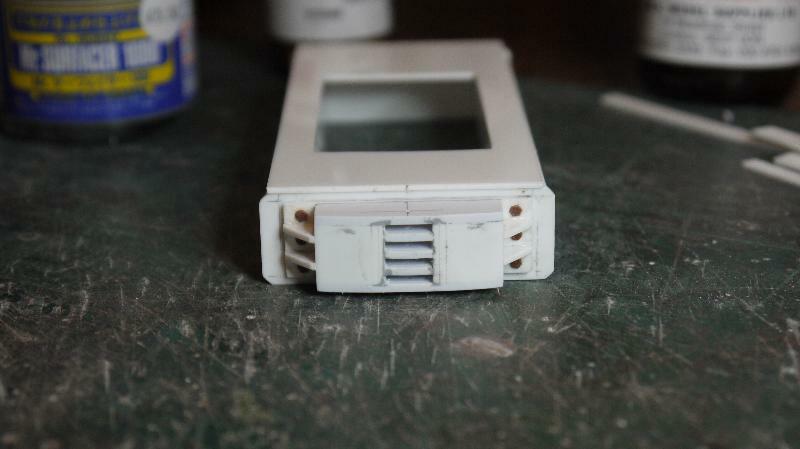 The access panels on the sides of the bonnet also need some handles adding. That will have to wait until next week after I get back from a weekend in Porthmadog on the Ffestiniog Railway - http://www.festrail.co.uk but you won't catch me on the webcams until mid April. This is turning in to an interesting little project. What is the factor which creates the limit for wheel sizes for use with that motor and gear set? The limiting factor affecting the maximum wheel size that can be fitted to a LoRider is the width of the motor and its proximity to the wheels. 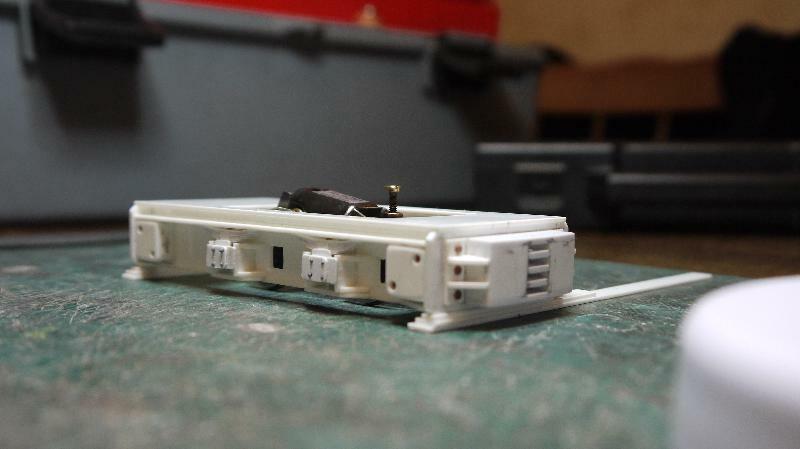 The LoRider is really designed for fitting to UK prototype DMUs and locos in 4mm scale, so would normally use 14mm diameter wheels. 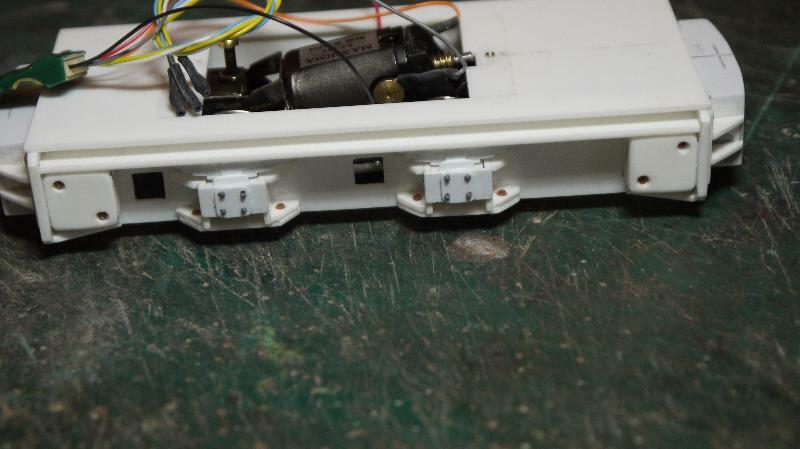 I found that the wheel backs can catch on the motor brush holders/connection tags with 19mm wheels on 16.5mm gauge, so went for the 16mm wheels as a compromise. Its all very close with the 16mm diameter wheels. 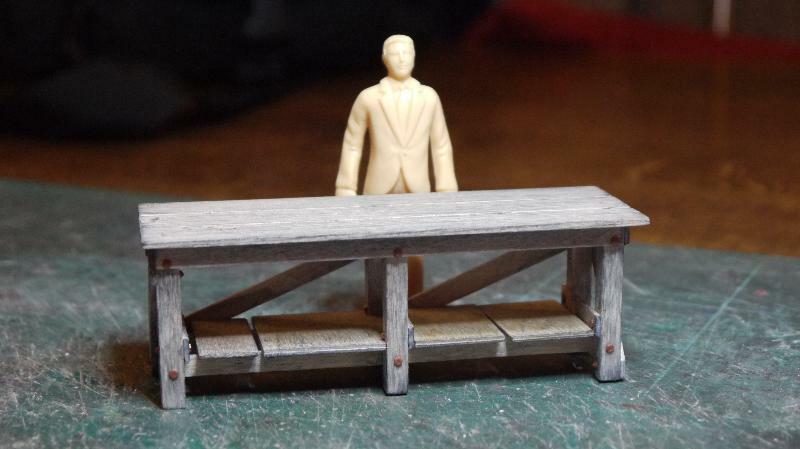 If I was building the model to run on 18.2mm gauge (EM standard) track or 3/4 inch gauge (On3 standard) track then fitting larger wheels should not be a problem. Wider gauges with the LoRider are easy to do as you cut the axles to suit your track gauge. 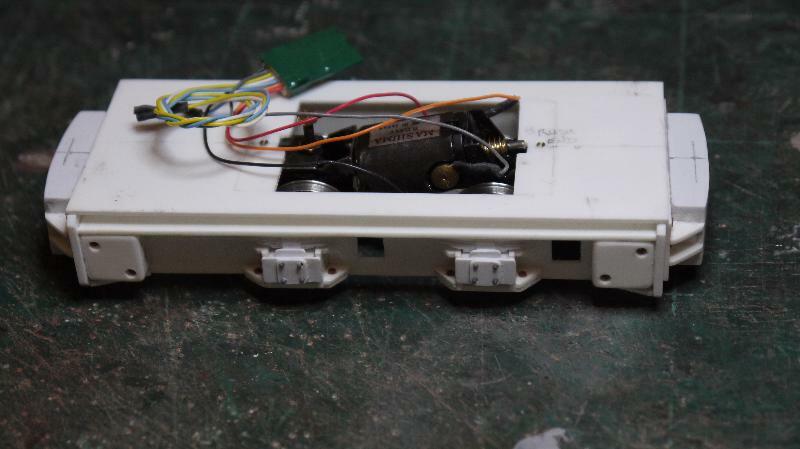 You can see in some of the earlier photos where I filed a bit off the lower part of the motor and added some thin styrene and the heat shrink on the motor connections to make absolutely sure that the wheels cannot touch the motor or its connections. This would not really be a problem with analogue control but could blow the chip with DCC control. Electricity is like smoke in wires - you are OK until the smoke gets out! The LoRider is available with either 27:1 or 48:1 gear ratios, and having got mine running I can confirm that the 48:1 ratio unit gives really good slow speed running, even with larger wheels than the unit was designed for. Ah, okay: my brain didn't get as far as noodling out that larger diameter wheels might also be thicker. Which makes perfect sense as a manufacturing condition. I should have added that the distance between the axle bearing and the motor is fixed, so the flanges of a larger diameter wheel than that intended by the manufacturer will be quite a bit closer to the motor. The wheels from Alan Gibson Workshop have a consistent tyre width and flange depth regardless of diameter. You may not be able to fit 16mm diameter wheels from another manufacturer if they have wider flanges or a narrower back-to-back dimension. 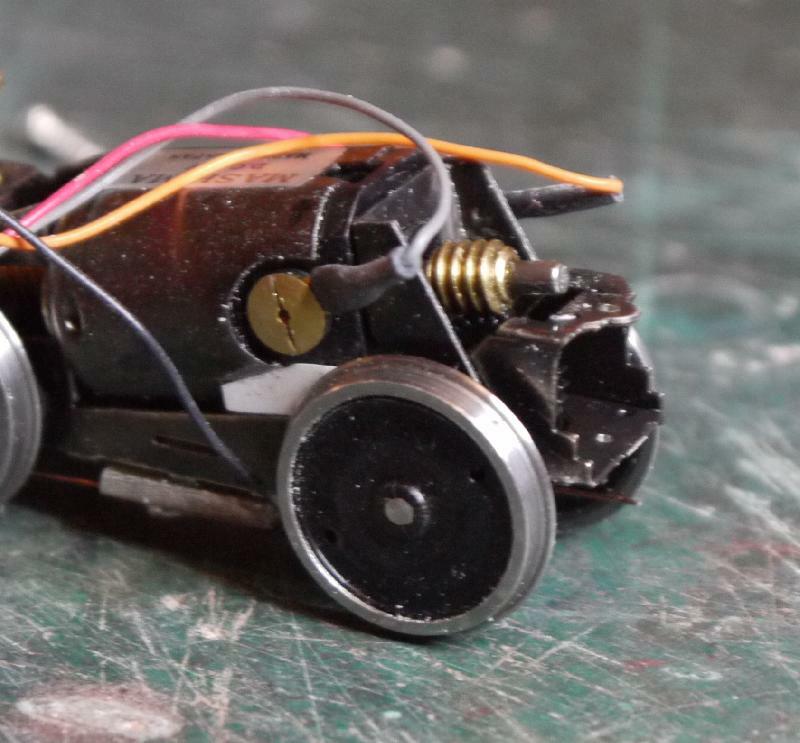 The 19mm diameter wheels were just a bit too big and were catching the motor connections. Hopefully these two close up shots should make things a bit clearer. Yes, it does help, Steve, I hadn't considered the motor terminals protruding like they do. Nice progress! For some reason I can now see all the pictures! Excellent looking beast Steve. I will be watching with interest.